Join Craig Torres for a Native Tea Workshop at the BTN Nursery! Back to Natives is hosting a native plant tea workshop on, Saturday November 12, 10AM – 12PM. 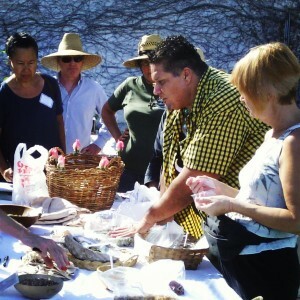 Craig Torres, a descendant of the Native American Tongva people who inhabited the Los Angeles Basin, will talk about the uses of different native plant teas, provide materials to make tea bags, and have sample teas to drink (bring a small cup!) Register and prepay at backtonatives.org. 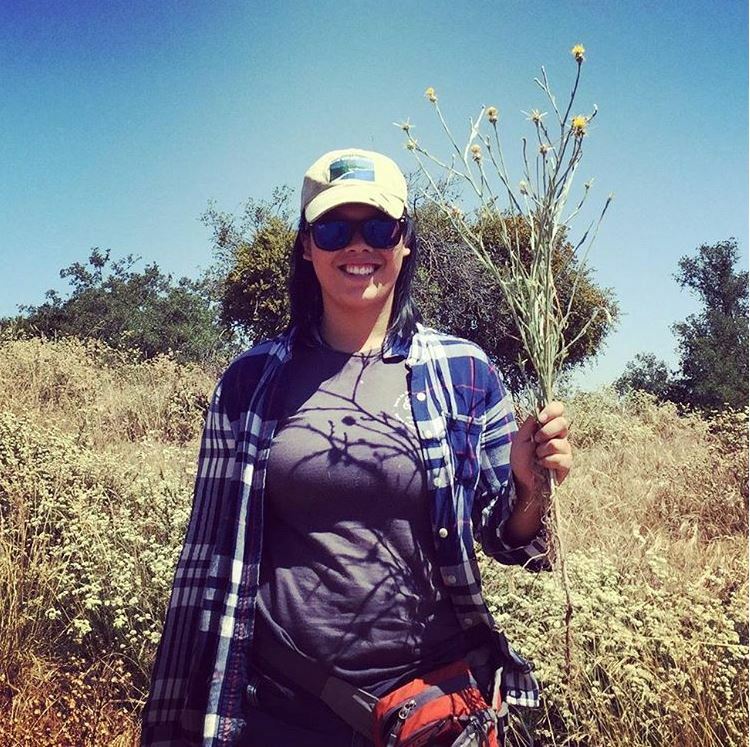 During this workshop, Torres will focus on ways to use different native plants in teas, including white sage (and other sages), wild rose (petals, blossoms, and hips), elderberry (blossoms and berries), yerba santa, yerba buena, and California juniper. Participants should come prepared to sample (bring a cup). Torres will also demonstrate making reusable, recyclable tea bags. This workshop will help attendees identify, cultivate and care for native plant teas they can grow on their own. 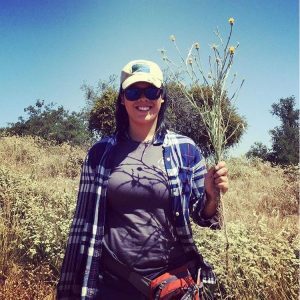 Back to Natives’ Native Plant Teas workshop will be held on Saturday November 12, 10AM – 12PM at the Back to Natives Nursery at Santiago Park, located near 600 E. Memory Lane in Santa Ana. Register and prepay at backtonatives.org. What I learned from Back to Natives: So many moving parts! Internship programs provide college students with the opportunity to learn new skills supplementing their education with real world experience. Oftentimes, internships are unpaid and offer experience as the only form of compensation. It takes true dedication to complete an unpaid internship. This is why it is imperative for students to research and determine whether or not their internship employer has their best interest in mind. 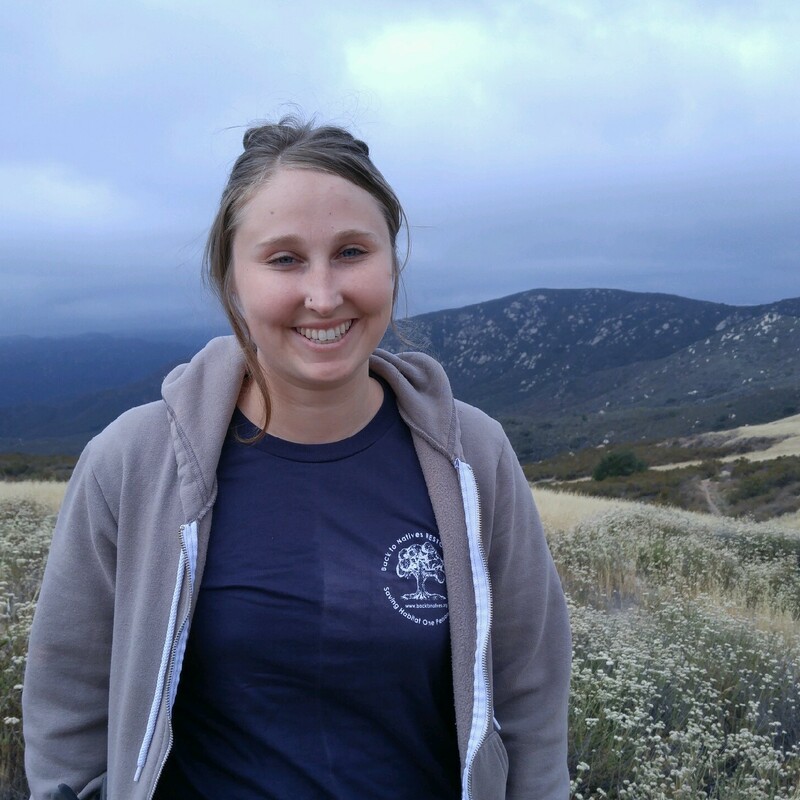 When I started searching for places to meet my internship requirement for graduation at California State University, Fullerton I wanted to be sure that my volunteer efforts would benefit the community I live in. I did not want give my time to an organization driven by profits and the bottom line. After searching through many internship postings I decided I wanted to work with a nonprofit aimed at the preservation of where I grew up and the things I hold dear. When I began my internship at Back to Natives, I had no experience in the communications industry. I had four years of theory circulating in my head never once having seen any of these concepts in action. It is easy to feel overwhelmed when learning new things, this was no different. The knowledge that my work would be posted online and read by others was always at the back of my mind. 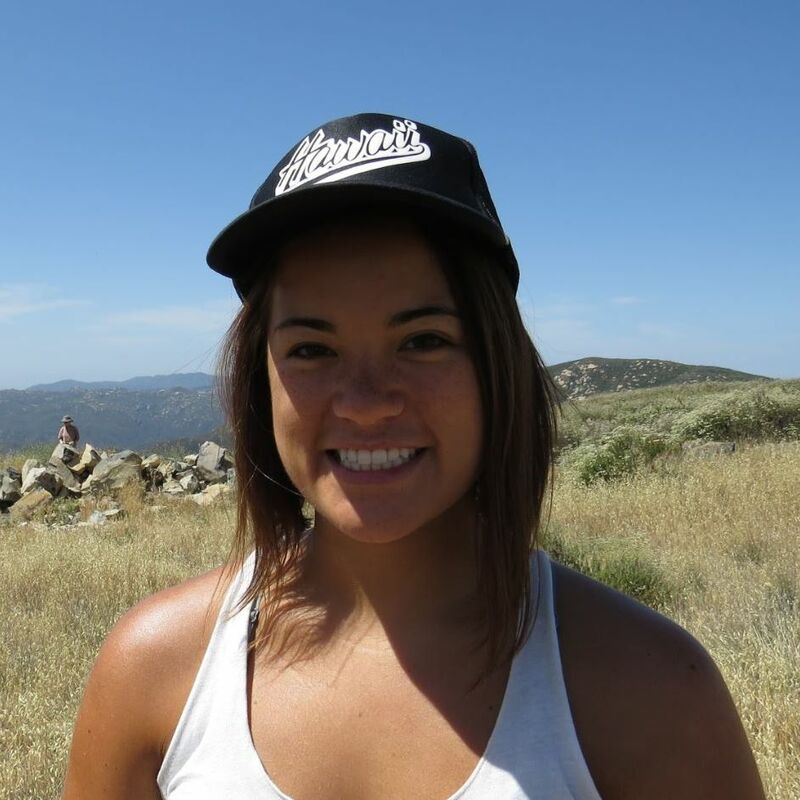 This apprehension was quickly put to rest by Back to Natives Education Director Lori Whalen. Having helped many interns before me, she had the knowledge and experience to tailor my internship to best supplement my education. The education and service learning programs truly provide students with hands on experience in their field. There are no meaningless errands to run or coffee trips to make. Interns are treated as the future professionals they are. If you are in need of an internship position or would like more information about internship opportunities with Back to Natives, please visit www.backtonatives.org/internships/ to find out how you can jumpstart your future while giving back. Only YOU can Restore Habitat! In 1924, the United States Forest Service (USFS) established the first wilderness area anywhere in the world, the Gila Wilderness on the Gila National Forest near Silver City, New Mexico. This was 20 years before they introduced one of the most iconic public service announcement campaigns in American history. It was 1944 when the United States Forest Service enlisted the help of “Smokey Bear” in their efforts to preserve America’s wilderness heritage. Since that time, generations of Americans have grown up with the understanding that it was up to them to prevent forest fires and preserve America’s wilderness. The USFS currently partners with a wide variety of nonprofits geared toward the preservation of America’s wildlands. 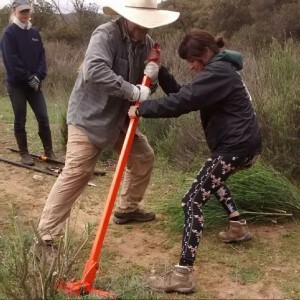 Back to Natives Restoration (BTN) in Santa Ana, California has partnered with the USFS for several years offering training programs and plant workshops aimed at restoring native habitat in the Orange County and surrounding areas. 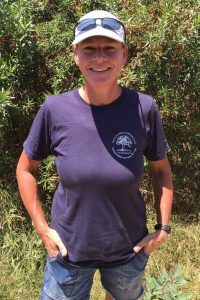 On August 20th, BTN will honor its volunteers of the year as well as distribute Dirt Shirts and Green Shirts to graduates of the United States Forest Service & Back to Natives Restoration joint training programs. There is a growing body of research examining the health benefits of volunteering. 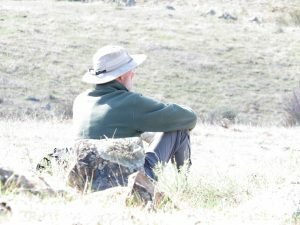 A connection between volunteering, social psychological factors and social networks can be described as the “social integration theory.” According to the Corporation for National and Community Service, this theory holds that an individual’s social connections, typically measured by the number of social roles that an individual has, can provide meaning and purpose to his or her life, while protecting him or her from isolation during difficult periods. Individuals who volunteer regularly are also less likely to succumb to depression and tend to live longer lives. (nationalservice.gov) Devoting time to the maintenance and preservation of things held in close regard can help individuals find their place in life giving them a sense of belonging and community, increasing their overall satisfaction with life. Back to Natives Restoration (BTN) fosters the growth of much more than native plants. BTN provides a professional environment where volunteers can grow personally and professionally while giving back to their communities. Regularly scheduled volunteer events in Orange County and surrounding areas provide many opportunities for those who participate to take an active part in the community. Back to Natives’ volunteer events allow volunteers to spend time in natural settings away from city life. John Kaiser is no stranger to all that volunteering has to offer. John is one of BTN’s 2015-16 volunteers of the year. He logged 307 hours over the past year with Back to Natives. 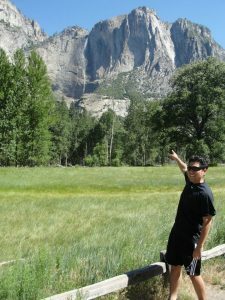 John has been volunteering with Back to Natives since he graduated from our first BTN USFS Restoration Training Class in 2007-8. After that he became a regular volunteer with Back to Natives, each year earning our volunteer of the year award for giving hundreds of hours of his time. John even spent several years on the Back to Natives Board of Directors (including two as the president). He became a native plant landscape design/installation client as well! 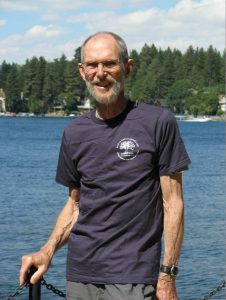 John is a retired Southern California resident who holds degrees in engineering mechanics from Stanford and Virginia Tech. 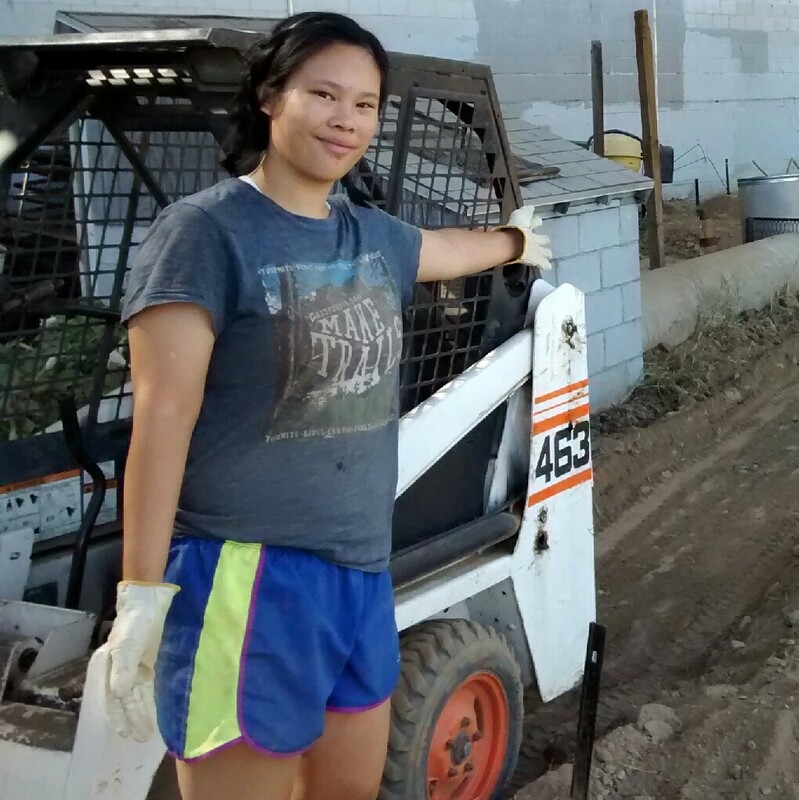 “I enjoy growing plants for restoration projects, being outdoors, and making a difference through volunteering.” Said John of his primary motivations for volunteering. While not everyone has the ability to volunteer as many hours as John, taking a few hours out of your busy schedule to get away from city life can do much alleviate stress. For more information on how to become involved please visit backtonatives.org/volunteer and see what events best fit your schedule. To help BTN continue our excellent volunteer and service learning programs, donate here. After watering all the plants in the nursery on Tuesday, we were off on another landscape maintenance adventure this time in Santa Ana (coastal sage zone) with Reggie leading the team (Ryan, Kennedy and I). This particular front yard was designed by Lori and installed by the BTN team the first quarter of this year. I was blown away by how fast the native plants had grown in and how the different foliage textures and colors created such a harmonious feel. In addition to installing a flowing brick walkway, the plants were intentionally planted on natural looking berms, much like they would look in nature. The blooming milkweed, white and Cleveland sage, California fuchsias, wooly blue curls, common yarrow, monkeyflowers and bush sunflowers set the entire yard ablaze with alluring color, a true celebration of the diversity of California’s flora. Complementing the grasses, sages, wildflowers etc. were 2 young California sycamore trees. The plant selection also created an inviting environment for wildlife (hummingbirds and butterflies in particular). In addition to learning from Reggie and Kennedy about identifying the various plants, I learned how to tell the difference between a monarch and queen butterfly, the later having orange with white spots on the top of its wings but otherwise looking just identical, and why butterflies have spots that look like eyes on the back of their wings. After the yard tour was complete and the “before” pics snapped, we checked to ensure the irrigation was working properly and adjusted the emitter heads where the flow was too low or high – one click to the left or right. After receiving excellent and funny instructions on how to properly use a post hole digger, we set about planting 3 purple three awn grass plants in a bare spot on top of a DG berm. Reggie demonstrated the proper way to plant native grasses. We then set up a new drip line and placed an emitter uphill and just outside the root ball of each plant. Next, we planted 2 sedges by the front door, breaking apart the root ball so that they could be planted in an arc shape with enough room between for the client’s German Shepard to still rest comfortably in her favorite spot! 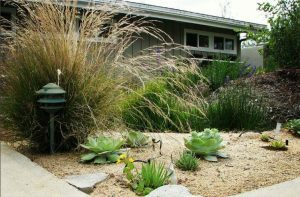 (This type of grass is the only native grass wherein the root ball can be tampered with; otherwise, it’s key to keep intact when planting). The sedges were root bound so were difficult to break up so we also received a lesson on how to carefully break apart the rhizome laterals in order to, in this instance, get the plant in the desired arc shape. On Thursday, watering the plants first thing in the morning was again top priority. There is definitely a learning curve to watering efficiently whilst not getting the leaves wet. And, I mustn’t forget to more carefully check for kinks in the hose line before scratching my head about why the water is all of a sudden not flowing! Once all the watering was complete, Albert showed me how he was installing the new irrigation for the 4″ pot tables in the back. Kennedy and I then set about removing the blue tarp from the top of the small greenhouse where we grow milkweed, and began to replace it with the shade cloth that had been measured and gusseted by Trina. I also had the pleasure of meeting John, who was lending a hand with putting manzanita seeds into soil in a tray that was going to receive a hot water treatment. I’m very much looking forward to learning much more about propagation including growing plants from seeds and the various techniques used to ensure healthy organic plant growth. After watering the nursery plants the next Tuesday with Kennedy, we both took the coastal sage scrub quiz administered by Trina. The fact that I can now identify the different indicator species from pictures and even spell the scientific names correctly was very gratifying. I’m getting a head start on similar homework assignments as I’m so enjoying learning how to identify the different native plant species. Trina, Ryan, and Kennedy then set off to Costa Mesa for a landscape maintenance assignment, while I stayed in the nursery to give Albert a hand with cutting PVC pipe and gluing on tees to build the irrigation manifolds for the 1 gallon plant tables in the back. Another extremely educational week for me! Thanks Reggie and Trina for sharing your knowledge with us all. The Association of American Colleges and Universities (AACU) believes internship programs are critical for student success. The AACU believes providing a physical location outside of a school setting in which students can test out theories and methods they have learned in the courses they have completed, fosters much more than academic growth. (aacu.org) It fosters learning rich with real world experience working as industry professionals. There is no better time to explore the wide range of professional and community experiences available, than when attending college. By becoming involved in an academic internship or service-learning program at a business, government, or nonprofit organization, students can gain working skills and build a network of professional contacts. These skills and experiences increase the likelihood students will find employment in their desired fields of study. Back to Natives Restoration is uniquely equipped to provide a place where students and those entering the green collar field of native habitat restoration, can implement the skills they have acquired during their education. Back to Natives Restoration (BTN) impacts the communities it serves on many levels. Our habitat restoration projects are part of a wide array of community engagement efforts set in motion to save habitat, one person at a time. BTN’s service learning workforce development program provides students and recent graduates the opportunity to gain real world hands on experience in various fields of study. Knowing why an organization does something is equally, if not more important than what that organization does. Back to Natives Restoration is motivated by its mission of saving habitat, one person at a time. For more information on what intern programs are available or how to volunteer, please visit our website and discover what the green collar field of native plant restoration has to offer. Back to Natives is joining the California Department of Fish and Wildlife to celebrate California Invasive Species Action Week. 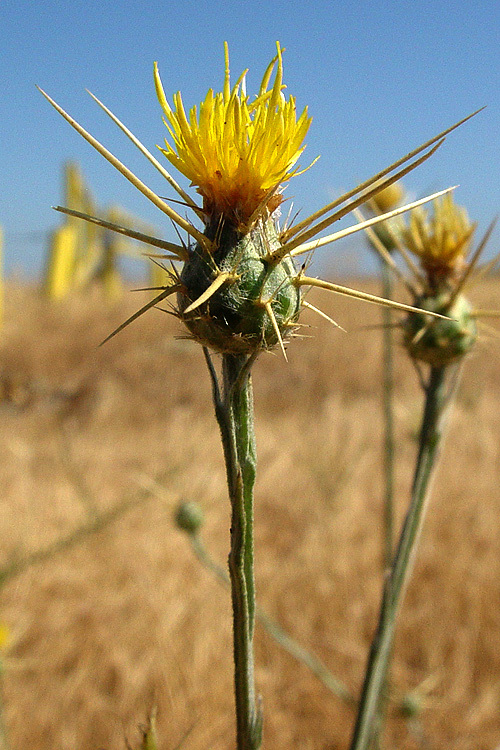 Beginning Saturday June 4 through Sunday June 12, multiple organizations will partner to raise awareness about invasive plant and animal species. Back to Natives Restoration will be one of the many organizations raising awareness and holding events during this year’s Action Week. Back to Natives Restoration has placed Fountain Grass (Pennisetum setaceum) squarely in its crosshairs this year as summer approaches. Fountain Grass is a strain of African bunchgrass that is planted as an ornamental plant in many regions of the United States where warm winters are commonplace. 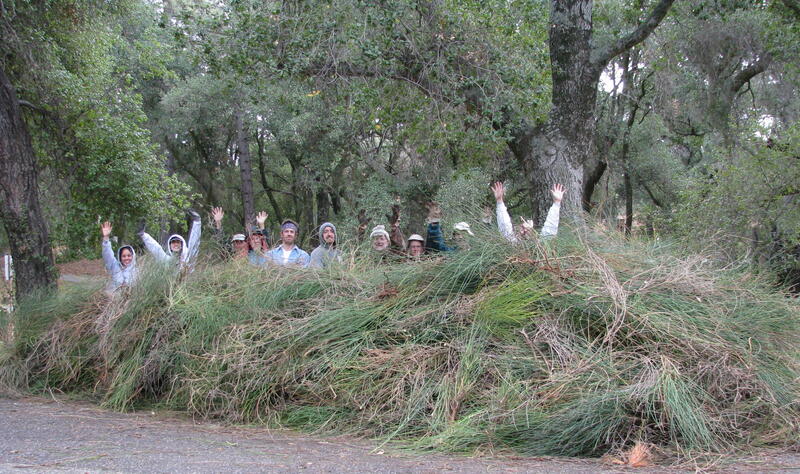 Volunteers from a local Boy Scout Troop will be assisting Back to Natives in removing Fountain Grass from Santiago Creek in Santa Ana on Saturday June 11. 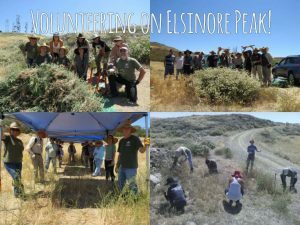 On June 5 and 12, BTN volunteers will remove invasive, non-native yellow star thistle from around Elsinore Peak in the Cleveland National Forest. You can sign up to help HERE! To raise awareness of the threat of invasive non-native species, BTN has developed a “Plant this not that” social media campaign, as well. 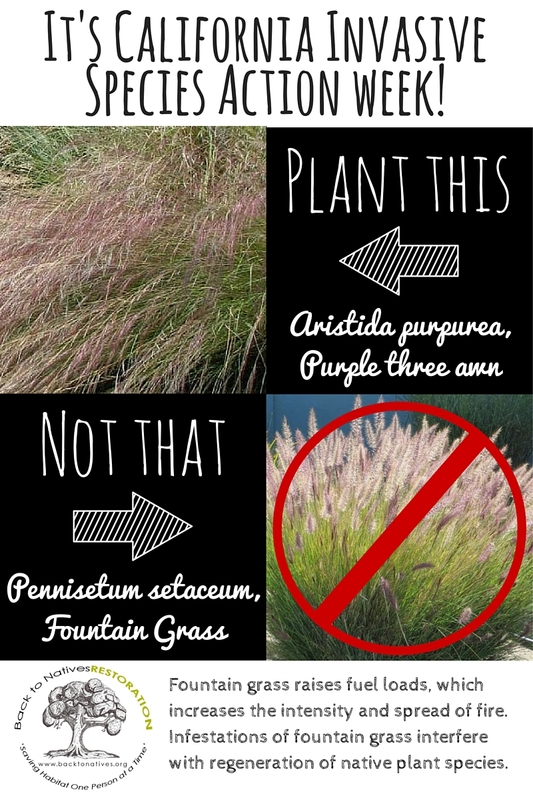 Each day during California Invasive Species Action Week BTN is posting a new infographic showing an invasive non-native plant commonly used in landscaping, as well as an alternative native plant that can be substituted. California is no stranger to warm winters. The state has experienced some of the warmest and driest years in recorded history. This lack of rain and increased heat have lead the Governor of California to issue a severe drought warning and state of emergency. These conditions create the perfect environment for a plant such as Fountain Grass which is uniquely suited for surviving hot and dry environments. 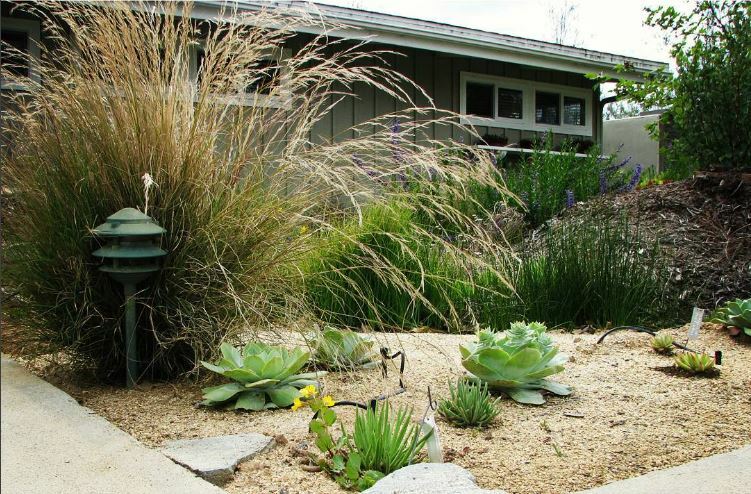 Fountain Grass has no natural enemies in California. 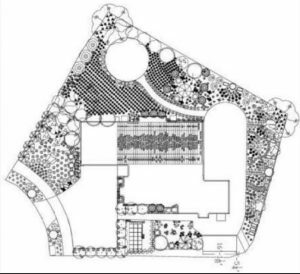 This allows the plant to out-compete native plants which are home to many insect and animal species. 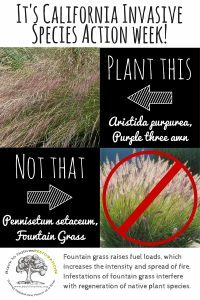 If you plant it on your property, you will soon have seedlings of Fountain Grass popping up wherever there is bare soil. It will even grow vigorously in the gaps between sections of concrete and bedrock of natural slopes. Fountain Grass’ ability to reproduce virtually anywhere there is bare soil converts this invasive plant into raw fuel for wildfires when temperatures rise. 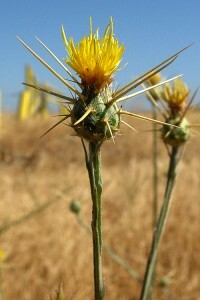 It has shallow roots that do not stabilize soil like many of the plants that are displaced by this invasive species. When rain does fall, these shallow roots are not strong enough to stabilize slopes which causes mud slides and soil erosion. Back to Natives Restoration will take the Fountain Grass situation head on this year as it hosts events aimed at offering sustainable solutions and alternatives to Fountain Grass. For more information regarding the Invasive Species Action Week 2016 please visit www.wildlife.ca.gov.